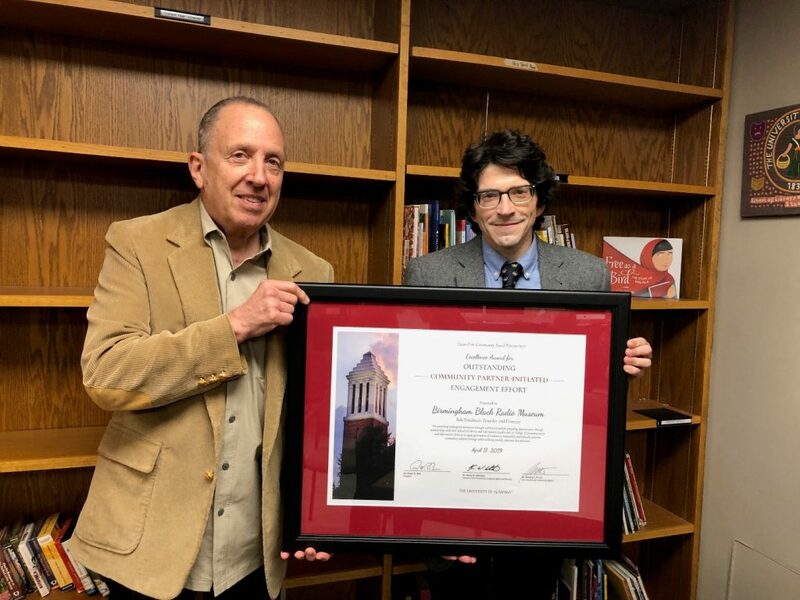 The School of Library and Information Studies hosted students, alumni, family, and faculty to recognize our outstanding MLIS and Book Arts students for Honors Day on April 5, 2019, at a ceremony on the fifth floor of Gorgas Library. Attendees enjoyed greetings by Dr. Mark Nelson, Dean of the College of Communication and Information Sciences, and an address on Book and Publication Arts from alumna Inge Bruggeman, Assistant Professor and Area Head Book & Publication Arts and the Black Rock Press at the University of Nevada, Reno. Please join us in congratulating these deserving recipients. Awarded to a part-time student pursuing an MLIS degree. The recipient was selected through faculty nomination and presented by Dr. Robert Riter. The 2019 recipient is Shakera Stanley. Awarded to students currently enrolled in SLIS and pursuing specializations in school or youth services. The recipient was selected by School Media/Youth services faculty and presented by Dr. Jamie Naidoo and Dr. Steven Yates. The 2019 recipient is Mary Beth Keenan. Awarded to a SLIS student on basis of service to the School, academic excellence, and professional promise. The recipient was selected through faculty nominations and a faculty vote and presented by Dr. Robert Riter and Dr. Jeff Weddle. The 2019 recipient is Jillian Sico. Awarded to students currently enrolled in SLIS and pursuing specializations in special libraries. The recipient is selected by Special Libraries Faculty and presented by Professor Sybil Bullock and Dr. Steven MacCall. The 2019 recipient is Alanna Barnett Cole. Awarded to a Book Arts student on the basis of academic/creative excellence, demonstrated leadership, and professional promise. The recipient was selected by Book Arts faculty and presented by Professor Sarah Bryant and Professor Anna Embree. Awarded to best paper written in fulfillment of a SLIS course requirement during the past academic year. The recipient was selected from student submissions, which were reviewed by a committee of three faculty members and the award was presented by committee chair, Dr. John Burgess, with Dr. Miriam Sweeney, and Dr. Jeff Weddle. The 2019 recipient is Craig Guild. Established in 1948 by a group of leading librarians and library educators, Beta Phi Mu was established to recognize and encourage scholastic achievement among library and information studies students. Students are nominated by faculty vote. Nominees were announced by James Gilbreath, President of the Beta Kappa Chapter of Beta Phi Mu. Pictured above (from left): Bob Friedman, Director of the BBRM, with Dr. Robert Riter, Assistant Professor and Archives Coordinator. Each spring, the Council on Community-Based Partnerships recognizes excellence in community-based scholarship. Students, faculty, staff and UA community partners are honored for outstanding research. Past projects have ranged widely, including health care, education, science and technology, art, literature, and special needs. Recipients are nominated by associates and peers. This spring, SLIS nominated community partner Bob Friedman and the Birmingham Black Radio Museum (BBRM) for the Excellence Award for Outstanding Community Partner-Initiated Engagement Effort. Along with the award, the BBRM and SLIS were awarded $2,000 in seed funds for their “Mapping Birmingham Black Radio” project. From the April 17, 2019 Community-Based Partnerships Award Luncheon Program: “The Birmingham Black Radio Museum (BBRM) is a community-based museum dedicated to preserving the history of Birmingham black radio and the pioneering role of broadcasters in supporting Civil Rights activities. A significant Alabama cultural heritage institution, the BBRM places particular emphasis on capturing endangered narratives through oral history. In his role as founder and director, Bob Friedman has secured multiple grants from national organizations to support the museum’s mission. As a result of his efforts, the BBRM has been invited to join Library of Congress consortia dedicated to preservation of radio. Additionally, in his role as mentor, Friedman has provided opportunities through partnerships with UA’s School of Library and Information Studies to prepare generations of students to responsibly and ethically preserve cultural heritage while utilizing socially conscious best practices.” Learn more about the BBRM here. 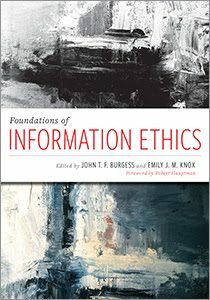 SLIS congratulates Assistant Professor Dr. John T. F. Burgess on the publication of Foundations of Information Ethics, a title he edited with Dr. Emily J. M. Knox for ALA-Neal Schuman. Dr. Burgess also contributed two chapters to the book, “Principles and Concepts in Information Ethics” and “History of Ethics in the Information Professions.” The book is a collection of essays by leading experts in the field of information ethics, providing an entrance into current scholarship in information ethics, and is written for both researchers and practitioners. At SLIS Dr. Burgess teaches Research Methods and Academic Librarianship, and in Fall 2019 will offer the course Information Ethics for the LIS Profession. 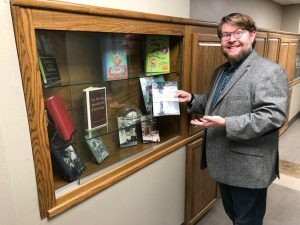 Pictured below: Dr. Burgess adds Foundations of Information Ethics to the SLIS Faculty Publications display. On Wednesday, March 20, SLIS hosted the third annual archival discussion lunch with Bob Friedman, director of the Birmingham Black Radio Museum (BBRM). Faculty, alumni, and current students came together and discussed current themes and conflicts in archives. The BBRM is one of many community archives engagement opportunities nurtured by Dr. Riter for SLIS students interested in archival studies. Pictured (left to right) above are a few of the lunch attendees: SLIS Assistant Director Dr. Ann Bourne, Emily Bibb (Curator of The Paul R. Jones Collection of American Art at The University of Alabama), Alex Smith (Digital Archivist at the Birmingham Civil Rights Institute), Bob Friedman, and SLIS Assistant Professor Dr. Robert Riter (Marie Drolet Bristol-EBSCO Endowed Professor and Archives Coordinator). During March 2019, The University of Alabama School of Library and Information Studies (SLIS) will award $20,822 in new, free books to elementary, middle, and high school libraries in Alabama via the SLIS Book Bonanza for the Black Belt & Beyond Program. School librarians in the Black Belt region were asked to apply for the book give-away program from January to February. We received applications from 30 highly deserving schools. The judges chose 6 school libraries in the Black Belt Region of the state to receive on average $2600 each in brand new children’s and/or young adult books. The judging of the applications was rigorous, as every school exemplified a significant need. We have selected 2 Book Bonanza Beyond winners. The Beyond winner is a low-income private school in the Black Belt Region of the state, or a public school demonstrating significant economic need in an area of the state outside of the Black Belt. The purpose of this award is to give an equally deserving school library, that is not eligible to be a Book Bonanza for the Black Belt Winner, a one-time opportunity to address literacy needs in their school community. Note: County listed is the county in which the school resides and not necessarily the name of the school system. Established in 2009 by Dr. Jamie Naidoo, the SLIS Book Bonanza for the Black Belt (& Beyond) is an annual program that provides free new books to school libraries in the Black Belt region of state. Schools in the Black Belt region are encouraged to apply again in January next year for a chance to receive free books for their school libraries during the next SLIS Book Bonanza for the Black Belt & Beyond Program. Low-income private schools in the Black Belt Region or schools in economically disadvantaged areas of the state outside the Black Belt are encouraged to apply next year (in January 2020) to be a Beyond Winner. If you need additional information about the program, please contact Dr. Jamie C. Naidoo at jcnaidoo@slis.ua.edu or SLIS at 205-348-4610. Information is also available on the program website: http://blackbeltbookbonanza.weebly.com. 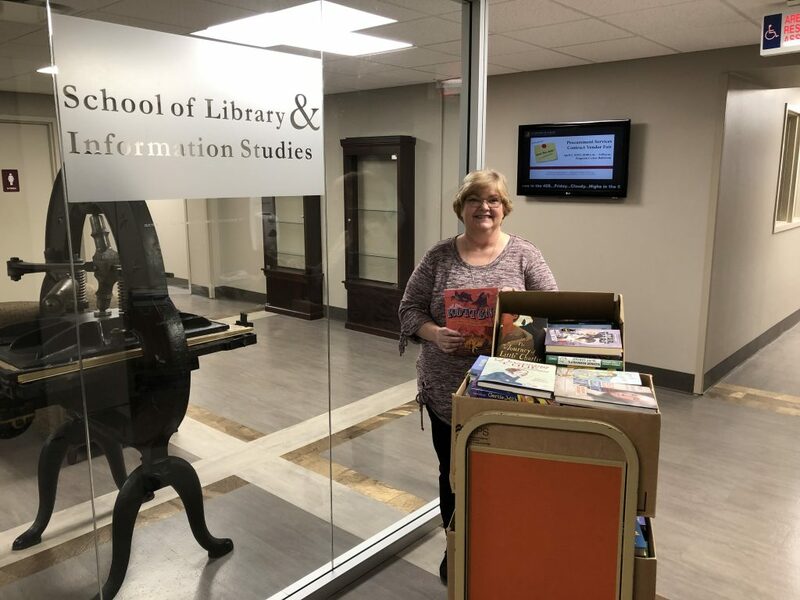 Pictured below: 2019 Book Bonanza Beyond Recipient Thorsby High School (Chilton County) Librarian Vanessa Langston receives boxes of new books in the eleventh year of the program.